There's a little cluster of shops in a long, low building where Garden Home Road meets 45th Avenue that has always seemed to me to need some sprucing up. For a long time, there was just a Mr. Suds Laundromat, Revive Organic Hair Salon and Abel Irrigation there. I've always felt that the building wasn't being used to its full potential in the way that Multnomah Village or Hillsdale Center are. Not that the residents of the area want that much bustle. And besides, it's not big enough to rival those two areas. But I always thought it would be nice if another useful shop or two would go in there, and that the whole thing might be tidied up a bit. Well, it seems my fantasy is coming true. Briar Patch Herbs has set up shop next to Revive Hair Salon, and what a welcome addition to the neighborhood it is! I stopped by to see what they have going on there and to meet the owners, Sheri Copans and Brad Valgardson, who are as friendly and helpful as can be. The shop is gorgeous inside and out, all the built-in shelves and cabinetry hand-fashioned by Brad himself. On one end of the space is an antique velvet sofa and a couple of chairs set up to create a nook where customers can sit and relax as they breathe in the wonderful, earthy aroma of the place. On the other end there are three tall tree trunks that flank the back counter, giving you the feeling of being outside while inside. As Sheri says, "I wanted it to feel like you were walking into a forest." Well, you do feel like that, if a forest felt as warm and cozy as the shop does. 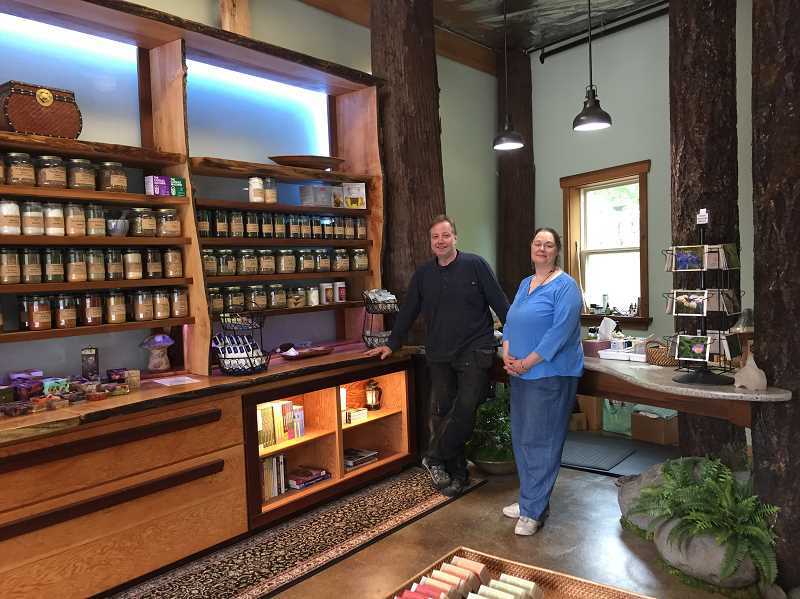 The Briar Patch sells organic culinary and medicinal herbs and seeds, as well as organic teas, tinctures, local hand-crafted soaps, candles, organic essential oils and all kinds of delightful, natural products. But please be clear: It is NOT a cannabis store. The Briar Patch is a family friendly, community herb shop, Sheri says. Kids are welcome, dogs are welcome — you get the idea. Sheri also let me know that the people who own Abel Irrigation at the opposite end of the building, Scott and Jenny Calvin, purchased the property a couple of years ago, and it is absolutely their intent to bring in another desirable business or two and to continue to make the building more attractive so that it will be a nice little destination, just a five-minute walk from Multnomah Village proper. Though Briar Patch Herbs' summer hours are Wednesday through Sunday, 11 a.m.-6 p.m., they are hoping to expand to seven days a week come fall. They also plan to begin serving brewed tea once their kitchen is set up, and host special events that welcome the community. Sheri even mentioned the potential for a dog wash day out front! So stop by and take a look at this beautiful space at 4480 S.W. Garden Home Road. You're sure to walk away with something healing, soothing or beautiful. And if you don't know what you want, they offer consultations as well. Don't you feel better already?